Korean Grocery Stores in Indiana! We all know that grocery shopping is super fun, especially for people who are looking for healthy, yummy food! So here is a list of the Korean grocery stores where we shop. 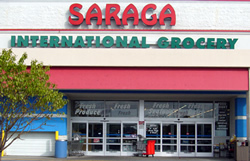 We have the most history with Saraga, where we shopped while in grad school at IU Bloomington. It also has two locations in Indianapolis on the west and south sides. The one we frequent on the west side, near the Lafayette mall, is international, meaning they have many items from multiple cultures, not just Asian. It is huge and is where we bought our kimchi pot as they have a large kitchen section. The store we shop at the most now is Brother’s, which is on Pendleton Pike. Like me, it is small and Korean, so you can find a lot of Korean-specific groceries there. They even sometimes have these super yummy pastries with bean paste and walnuts in them (yes, vegan!) that you can get on the streets of Seoul. When we’re in Lafayette, we go to Hana Market. It is also a Korean grocery store and fairly large. Oh, and don’t forget that you can get many items online from stores such as Hmart too! Hmart has HUGE stores in the D.C. area where we bought our rice cooker when visiting friends, it was so much fun! Does anyone know of any others we should know about? Please share and let us know where you shop for yummy asian groceries by replying with comments, whether you are in Indiana or not! Ah, Bloomington – how I love and miss it and it’s food scene. Definitely some Korean options there as well in terms of restaurants, and a couple of the Asian grocery stores (at least there used to be – it’s been a while since we lived there, but I’d be surprised if that’s not the case). Glad to have you as a follower!